Magic Johnson's surprising decision to resign as the Lakers' president of basketball operations made it clear that the organization is exactly as dysfunctional as it seems. So what does L.A. need to go back to its winning ways? They need someone who could make cold decisions and make high stake calls. After seven months of Lakers news, the grand finale did not disappoint. On Tuesday night, Magic Johnson announced he was stepping down. It was a move that blindsided reporters, players, and fellow Lakers employees. Magic delivered the news over the course of a press conference that lasted approximately 50 minutes. "I’m a free bird," he said at one point. During an ESPN interview he announced, "I get to TWEET when I WANT." Somewhere in the middle of all this, Magic told reporters that, no, he hadn't yet informed Jeanie Buss of the news, but on Monday they'd had a three-hour meeting to discuss the future of the team. Then he reiterated his eternal loyalty to Buss. And really, if we're being honest, all of it was perfect. Magic rambling, Rob Pelinka invisible, low-level employees caught in the middle, Jeanie Buss marginalized. For months now there have been increasing suspicions that the Lakers were more incompetent than anyone realized, and Tuesday was our official confirmation. It turns out the Lakers are exactly as dysfunctional as they seem. There are several directions to take the conversation moving forward, but to begin with, if anyone is wondering what went wrong with Magic and what the Lakers need going forward, I think the answer is the same. 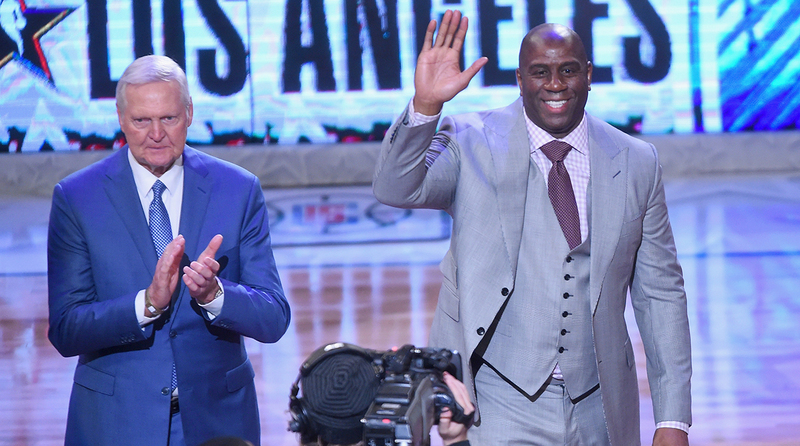 The Lakers need Jerry West, not Magic Johnson. Think about the Lonzo Ball pick in retrospect. When he's healthy, Lonzo is good. He can be invisible for long stretches, but he fits well on a winning team, and he'll have a place in the NBA for 15 years. The problem is that he'll probably never be the type of player a team is hoping for with the No. 2 pick. There are already five players drafted after him—Jayson Tatum, De'Aaron Fox, Lauri Markkanen, Donovan Mitchell, and John Collins—who will likely have better careers in the NBA. And while many would contend that it's unfair to second-guess a pick that was largely popular at the time, most of the popularity was the by-product of unprecedented media hype. All along, there were plenty of scouts who had misgivings about Lonzo's shooting and athleticism and how that would affect his long-term upside. Magic's job in that draft was to look past the Lonzo hype and draft a player who could be a star. It wasn't an easy decision, and passing on Ball wouldn't have been popular. But ultimately, it was exactly the sort of cold and calculating decision that Jerry West would have made. Or, if you prefer, it's almost exactly the decision Danny Ainge did make when he passed on Markelle Fultz and traded for Tatum—something Ainge could only do because the Lakers had already telegraphed the Lonzo pick. The Lakers deserve management that can make those high stakes calls and come away winning. The Lonzo pick is far from the most egregious decision of Magic's Lakers tenure, but it cuts to the core of what's been missing. There's an art to running a basketball team that's been lost on the Lakers over the course of the past decade. When I say the Lakers need Jerry West, I don't mean that literally. West, while currently employed by the Clippers, is 80-years old. He's not necessarily capable of assuming the day-to-day responsibilities of running a basketball team, and in any case, he's probably not interested. He's also the greatest G.M. in NBA history, so I recognize that this is a high bar for potential successors to clear. Nevertheless, it's the qualities that made West great—great scouting instincts, guile, introspection, foresight—that have been missing in L.A. It's hard not to view the Jeannie Buss' partnership with Magic as a move that was 180 degrees in the opposite direction. Magic is famous, great in press conferences, and both smarter and more competitive than his public persona suggests. He deserves credit for landing LeBron James, regardless how inevitable that move seems now. But Magic was too casual with his proclamations in the media and he was too clumsy behind the scenes. He doesn't give a damn about scouting. He hasn't shown much guile in trade talks or free agency. Introspection has become a blindspot for the entire organization. And at this point, after the way this team built around LeBron in July, Magic’s foresight has become in its own punchline. Anyone wondering exactly what happened to this year’s the Lakers has several deep dives to choose from. Dave McMenamin and ESPN did a great job over here, while Bill Oram and The Athletic did an excellent job over here. The particular circumstances surrounding Magic's dismissal remain incredibly strange, and I'm sure more context will emerge in the days and weeks to come. But if anyone is wondering about problems in L.A. and looking for bigger answers than the details of the past twelve months, I think that empowering Magic and disregarding his flaws was indicative of a fundamental misunderstanding of what has always made the Lakers special. It's a problem that predates Magic. The same way this summer’s Lakers may be left selling themselves on a Jimmy Butler and LeBron partnership, it was only a few years ago that they trying to pair Kobe and Carmelo, and then Kobe and Lamarcus Aldridge. As some of L.A.'s built-in advantages in free agency have disappeared over the years, there's been no plan B, and not even a recognition that different kinds of investments might be required going forward. That would mean the Lakers focusing more on addressing hard questions —"Why aren't any of our lottery picks flourishing here? Why are our players constantly injured? "—and less on easy solutions that don't actually make much sense—"Will the Pelicans take all four of these underwhelming young players? Would Kyrie Irving take a meeting this summer? Everyone can laugh about Lakers exceptionalism, but that part isn't a joke. Go to a game. The team's history is staggering, the standards are clear as soon as you look up at the rafters, and when the Lakers are good or even just half-decent, the fans in L.A. are still as great as any fanbase in the NBA. The culture is real. So is the mystique. The problem is that the culture wasn't necessarily about what the current regime thinks it was about, and the mystique was rooted in the franchise's borderline supernatural ability to conjure tangible basketball solutions that kept everything rolling on the court. In its place, the modern Lakers keep coming back with half-baked power plays that insult everyone's intelligence. As the Buss children work to restore the reputation of the team they inherited, I'm pretty sure they've been chasing the wrong things. The Lakers never used to bet the future on aging superstars; they stole Shaq and Pau in the middle of their prime. They didn't bow to consensus on draft night; they traded for Kobe. And when the Lakers were great, they weren't just more famous than anyone in the NBA. They were smarter, too.